You’ve done everything right in trying to motivate your team yet something is still off. Your team still lacks motivation and you’re not sure why. The lack of motivation for your team may actually be coming from you. Gasp, shock, horror… I know. Yet if the team you’re leading lacks motivation and the reason is you, there’s good news. You can make changes once you realize what you’re doing. 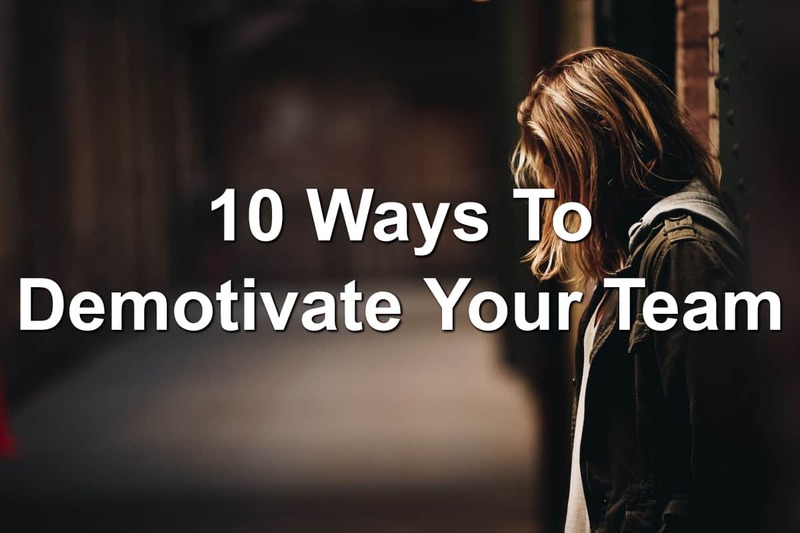 We’re going to take a look at 10 ways leaders demotivate their team. With this knowledge, you can begin to make changes that will revolutionize your organization. You’ve told your team you trust them. You’ve encouraged them to take charge. And then you grab the reigns and micromanage every aspect of their position. By trying to micromanage what your team is doing, you demotivate them. You show them you don’t trust them or you believe your way is better than theirs. As I’m training for the Metro Health Grand Rapids Marathon with Team World Vision (click HERE to help me bring clean to water children in Africa), I’ve fallen in love with an African proverb they use. The African proverb is: If you want to go fast, go alone. If you want to go far, go together. Team members who are falling behind aren’t feeling good about themselves or their work. They see other team members slowly pulling ahead and see themselves struggling to catch up. This feeling of helplessness hurts. The discouragement and voices in their heads tell them there is no hope. Eventually, they will give up if no one is next to them. It’s hard for team members to be motivated when their goals are constantly shifted. Whether this is from a lack of focus or leadership thinking the next new thing will be what makes the business, lack of focus will drain the motivation of your team. Look for ways to have a clear focus. Of moving towards one, singular, focused goal. There will be times when you will be wrong. You will make the wrong decision or say the wrong things. This is life. Your team understands this. They know you’re human and leaders make mistakes. What demotivates them is when you are unwilling to accept your mistakes and apologize when you’re wrong. You bring in an outside consulting firm to help you build your business. When the people you hired to help you improve your business offers you suggestions and you fail to listen, your team will become discouraged. They see you’re not serious about growing. They see you being stubborn. And they see the business continuing to stay stagnant or decline. Listen to those who are wiser than you. Take their counsel. Make the necessary changes. A lack of communication can send damaging ripples throughout your organization. A lack of communication will get the rumor mill pumping. Your team relies on you to communicate what is happening within your organization. They’re looking to hear the good (and the bad) from you. If they begin hearing negative reports from outside sources that turn out to be true, do you know what happens? Your team begins to feel demotivated. They feel you don’t trust them. And they will struggle to trust you. Have you ever had someone constantly criticize you? You know this isn’t a way to motivate your team. Yet so many leaders constantly criticize those they lead and expect them to do a great job. Constant criticism breaks down a person. They feel like they’re less of a person because of the nasty things being said to them. Be careful of the negative words you say you to your team. These demoralizing words will demotivate your team. You demand excellence. You want to have a team of rock stars. But do you celebrate those rock stars when they do something epic? You might or you might not. One of the justifications for not celebrating the success of team members is that success is expected. Why celebrate success? Because celebrating success shows your team you care and you notice what’s going on. Failing to celebrate success communicates you’re not paying attention. Your team is expected to do a great job. They’re expected to work long and hard for their pay. The question is: Is the pay they’re given fair? You have to ask yourself this question. Pay may not be the most motivating factor an employee looks for but it is a major factor to their motivation. Leaders need to lead. They have to be the example they claim to be. By failing to lead, you will fail to motivate. And when you fail to motivate, team members begin to drop off. Don’t let your failure to lead be the reason your team is demotivated. Question: What other ways do leaders demotivate their team? Share your thoughts in the comment section below.